The remarkable Elizabethan woman, Bess of Hardwick, Countess of Shrewsbury, engineered a marriage between her daughter, Elizabeth, and Charles Stuart, the brother of Mary, Queen of Scots' husband, Henry Stuart, Lord Darnley. Any child of Charles Stuart had a claim to the succession after the death of the childless Elizabeth I, and so a hurried marriage was arranged at Rufford Abbey in Nottinghamshire. 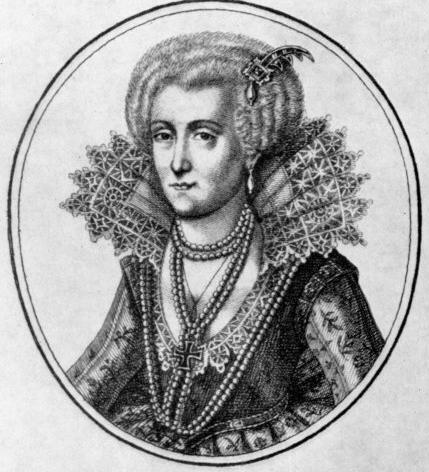 Arabella Stuart was born in 1575. In the autumn of that year the little girl was baptized in the tiny village of Edensor. The custom of the time prescribed that those of high rank be christened, not in the private chapel of the family home, but publicly with all the ceremony befitting the rank of the child. Edensor was the nearest parish church to the imposing Chatsworth House. 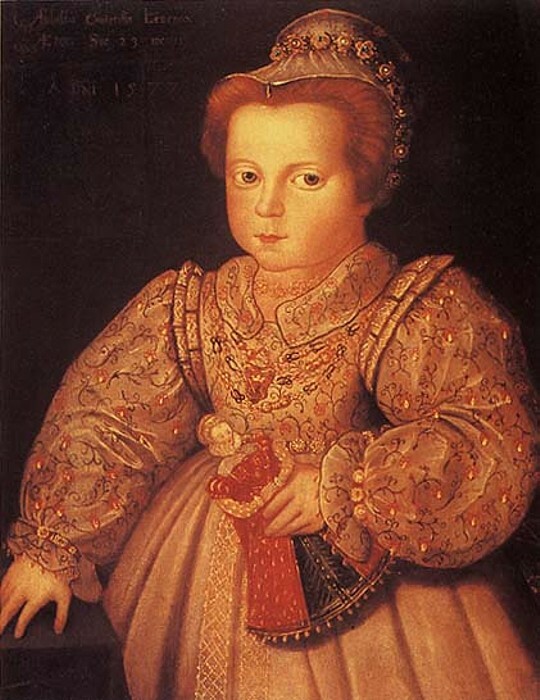 The child's family connexions were impressive; first cousin of James VI of Scotland; niece of Mary, Queen of Scots; cousin-german of Queen Elizabeth of England; heiress of the earldom of Lennox in her own right, and sixth in succession to the English throne. She was also the grand-daughter of the Countess of Shrewsbury - and the 'jewel' of that formidable lady's eye. With the many guests from Court, and representatives of neighbouring families, were mingling a few of Sir Francis Walsingham's spies. The baby was lying in the arms of one of her sponsors, Lady Mary Talbot, step-daughter of Bess. The naming of the infant proceeded in the manner proper to her semi-royal state. Charles Cavendish, one of Arabella's uncles, recorded the event. Arabella whimpered as a fine, white vestment, called a 'chrysome', was laid over her and she was carried, with due solemnity, to the font in the centre of the nave. Beside Lady Mary stood another of Arabella's uncles, William Cavendish. These two are the only sponsors recorded, but there were probably three or four others. The child was splashed with holy water and anointed with oil. The sponsors offered gifts of gold and silver which were in turn blessed by the priest. When christening service was over, Lady Arabella Stuart was very rarely, if ever, seen again by the public until she was twelve years old. Margaret Lennox took both parents and child back to London with her. When Charles Stuart, Earl of Lennox, succumbed to the destruction of his lungs in Apr 1576, he was twenty-one years old and eighteen months married. His death started a wrangle, involving the child Arabella, which was to last for some time. But James VI of Scotland, or the Regent Morton, at Charles's death, disregarded the rightful heir, Arabella, and pronounced the title extinct. This caused a furore in the household of the two Lady Lennoxes. Margaret Lennox wrote at once to the Scottish Council demanding that the earldom be given back to the baby Arabella. So sure was Margaret that she was in the right, that she had a portrait painted of the baby at twenty-three months old; the infant is propped upright and dressed as a miniature adult. A plump child's face gazes solemnly from the can vas. In her hand she clutches a doll which perhaps she could not be induced to surrender. Bracelets, a necklet and a pearl-encrusted coronet adorn the baby figure. In the top left-hand corner of the painting is inscribed 'Arabella Comttessa Levinae', arrogantly insisted upon by Margaret Lennox, that this infant was, in fact, the rightful Countess of Lennox. Margaret's demand, the Regent Morton tartly replied that, as James had been a minor when the title was granted to the child's father, it could be re-voked at any time. And because the claimant was a female, this was as good a time to do it as any. Margaret turned to Mary Stuart to enlist her aid in getting her son to disgorge the title. Mary, who supported the child, drafted a codicil to her will, dated Feb 1577, in which she commanded James to relinquish the title in favour of Arabella. The following year Mary repeated her wishes to the Bishop of Glasgow. This, in turn, had not the slightest effect, and in May 1578 conferred the Earldom of Lennox upon Robert Stuart, Bishop of Caithness, Mathew Stuart's brother. Bess felt less kindly towards Queen Mary of Scots after Arabella's birth. The Countess of Lennox died in 1578. Elizabeth seized the English estates of the departed Countess. At the same time she let it be known that the child, Arabella, was now under her protection. Bess and her husband both solicited Robert Dudley, Earl of Leicester, to remind the Queen of the exigency of Lady Lennox and her infant. For this purpose Bess had declared a temporary truce in her quarrel with Shrewsbury. But Bess did not rely solely upon the Queen of England to succour her grandchild. At that time she was on good terms with her husband's prisoner, Mary Stuart, whose aid she enlisted in an attempt to procure for Arabella any of the deceased Countess's possessions, not yet seized by the Crown. 1. A jewel set with a fair table diamond, a table ruby, and an emerald with a fair great pearl. 2. A cross all set with fair great diamonds, with a square linked chain. 3. A jewel set with a ballast and a fair table diamond set be-neath it. 4. A H (shaped) of gold set with rock ruby. 5. A burrish set with a fair diamond. 6. A rose set with fair diamonds. 7. A carcenet set with table diamonds. 8. A girdle set with table diamonds. 9. A border set with table diamonds. 10. A fair pearl chain. 11. A chain set with rock rubies, pillar wise. 12. A chain of small turquoise set upon a three-square pillar. 13. A clock set in crystal with a wolf of gold upon. 14. Buttons of rock rubies to set on a gown. 15. Table diamonds to set upon a sleeve. 16. Two tablets of gold, the one with two agates with divers small turquoise; the other enamelled the form of a globe. 17. Bracelets, two pair; one of agate, and the other of plain gold with other things that be not yet in memory. Leicester did not do so well as Bess had hoped when he broached the Queen on the subject of an allowance of the widowed Countess and her baby, Arabella. The Queen, knowing that Bess could well afford their upkeep, was not disposed to subsidize the bereaved in a life of luxury. Only because 'Sweet Robin' was the supplicant, Elizabeth grudgingly bestowed a pension of £400 a year on the Countess of Lennox and £200 for Arabella. As for the jewellery she did not even get a glimpse of them. 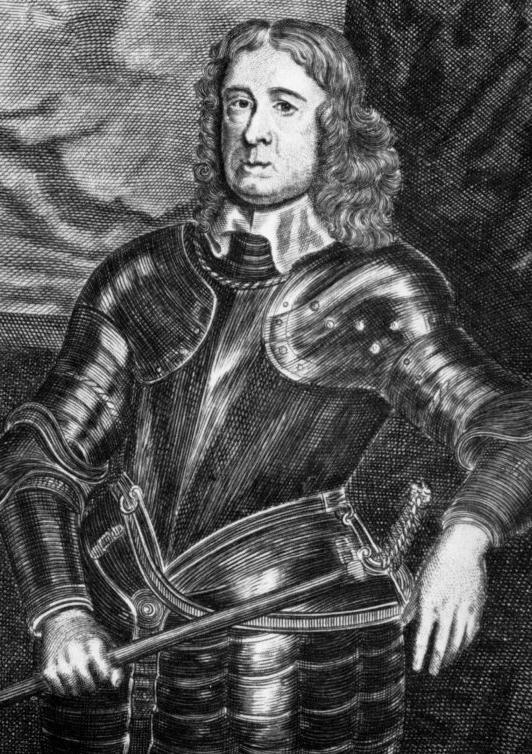 Thomas Fowler, before the warrant reached him, had returned to Scotland taking the casket with him. Soon after his arrival in Scotland, Fowler died and the jewels were seized by the Crown. Later, Fowler's son, acting on behalf of Arabella, tried unsuccessfully to get the Scots to hand them back. As with her Lennox title, the jewels were hers by right, but James had them both and meant to keep them. Arabella and her mother came to live with Bess. Entirely dependent upon Bess, Arabella's mother had no alternative but to yield to the old lady's positive ideas on the upbringing of Arabella. By the time the little girl was six years old, an educational routine had been established from which the child was not allowed to deviate. At seven, she was fluent in French and Latin and well-versed in Italian. Chubby fingers could sew a fine seam, but she found embroidery with stiff silver and gold thread difficult. Long hours were spent mastering the virginals and the lute; and to comport herself with grace in the intricate dances of the period. She was not considered a pretty child but she bore herself well with an excellent carriage inculcated by Bess, herself noted for her splendid straight-backed figure. There were no children of her own age at Chatsworth or Sheffield with whom she could play, or even share her lessons with. Her mother, still grieving for her lost husband, paid but scant attention to her only child. The Earl of Shrewsbury was an austere and remote figure to Arabella, preoccupied as he was with the problem of Mary Stuart, now confined a close prisoner in the Turret House of Sheffield Castle. During the Twelfth Night celebrations at Sheffield, in the year 1582, Arabella's mother complained of feeling unwell. 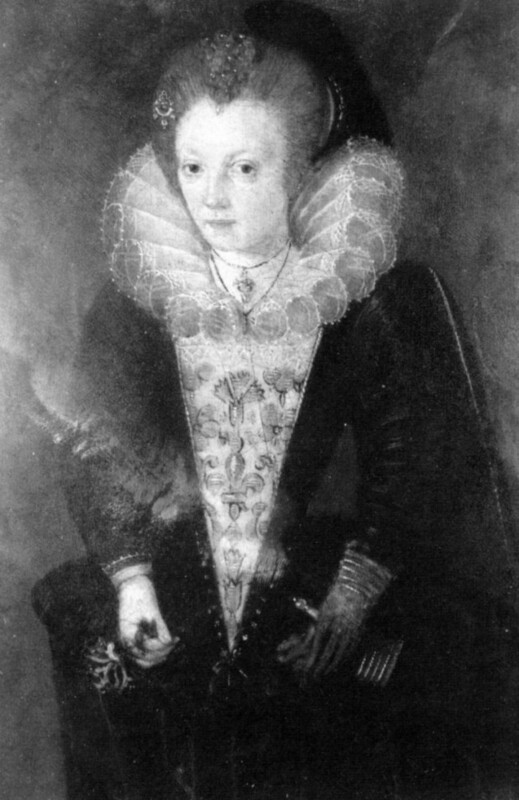 Elizabeth Cavendish, Countes of Lennox, died in 1582, at twenty seven years old, leaving the child in the entire care of Bess. Bess wished to discredit Mary Stuart from the right to the Throne, so that Arabella would be closer to the position. Queen Mary spent a great deal of time with the child and became fond of her. When she found out Bess's plans for Arabella to inherit the English Throne, the relationship between the two women became very bitter. Bess replaced the old house with what is known as Hardwick Hall from 1585. She built this and furnished it for a future Queen of England, which she hoped Arabella to be. Others say that she built this house to be "a craddle to her birth place". She wanted her house to be unlike any before or after it. Queen Elizabeth was childless and would, with certainty, remain so. Bess felt justified in giving orders to the household staff to address the Lady Arabella as 'Your Highness'. The child was, henceforth, to be treated as royalty; served first at table, after the food had been tasted for poison; given precedence over everyone, and curtsies to her were to be as low as those to the Queen. But Arabella herself was kept firmly at her books. But Queen Elizabeth remained obstinately silent on the subject of her successor. Despite Bess's optimism, she concluded that matters must be pushed a step further. Arabella must make a suitable marriage. Lady Shrewsbury, experienced match-maker that she was, cast about for a husband for her 'jewel'. Her choice for Arabella was the Earl of Leicester's son, Lord Denbigh, who was just two years old. Leicester saw in the marriage arrangement a way of staying close to the throne. Should Arabella succeed he would be in the enviable position of being the Queen's father-in-law. Latterly. Arabella and Robert, Lord Denbigh were formally betrothed. Arabella sent a present to the little boy together with a miniature of herself. She listened gravely as her grandmother explained that it would be some years before she was wed, and then trotted obediently back to her books. Predictably, Elizabeth was outraged when she received the news of the betrothal. Promptly, Leicester was ordered from the Court. Unfortunately, Lord Denbigh died in Jul 1584. No other marriage agreements were undertaken after this as to not tempt fate. In Jan of 1587 Elizabeth scrawled her ornate signature on Mary's death-warrant. And a few weeks later Mary died horribly at Fotheringay. While the population of London danced in the streets in celebration of the ghastly event, perhaps Arabella, eleven years old, wept for the memory of the lady she had known all her life. It is unlikely that the child thought of the dead woman as another barrier removed from her path to the throne. James, King of Scotland was now assumed to be heir-presumptive to the throne of England, but it remained for Elizabeth to name her successor. Arabella's claim was as valid as James's; but with one important qualification. Arabella had been born in England, while James was of alien birth and, by English law, this fact debarred him from succeeding. The King of Scotland insisted upon a written document ensuring his succession. More than that he had had the impertinence to haughtily request that Elizabeth see to it that the other claimant did not contract a marriage that might strengthen her position. Any talk of the succession presupposed Elizabeth's death, and this was one subject the Queen could not bear to contemplate. To teach James a les son for daring to presume too far Elizabeth promptly, and openly, acknowledged that there was another in the running. Arabella was invited to the Court for the first time. Temporarily under a cloud of royal displeasure, because of her marital dispute with Shrewsbury, Bess did not accompany the child to Court but sent her in the care of her son, Charles Cavendish. 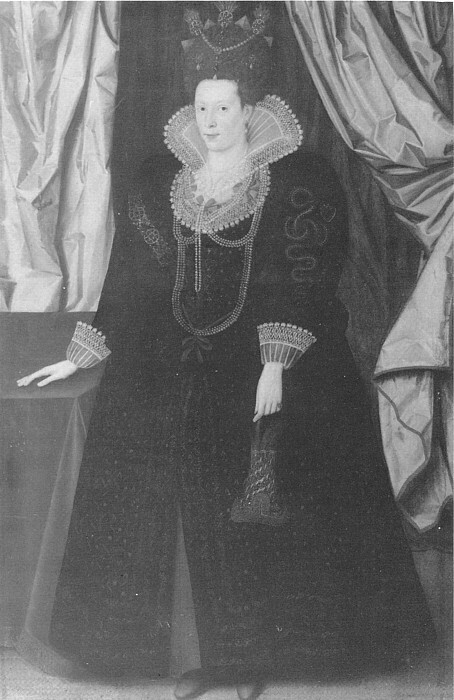 During the summer of 1587, Arabella was staying in London with Mary Talbot at Shrewsbury House. In aug that year, at the age of 12 years she went to Court and dined with the Queen Elizabeth. At Court, Arabella found to her delight that she was treated with all the deference due to her rank and, as the only Princess of the Blood in England, took precedence over all the other ladies. In 1588 Arabella returned to Court. This is recalled as a disgrace, Arabella insisted that she was more important than others in the Queen's presence, which caused conflicts and her being ordered from Court by the Master of Ceremonies. In 1590, Lord Shrewsbury died and Bess regained all her lands, Wingfield Manor, its iron works, Smithies and glass works, Bolsover Castle and its coal pits, the parks at Alveton in Staffordshire, Shirland in Derbyshire and Over Uden in Yorkshire for their pastures. Minerals and timbers in her tenure were exploited and she gained a large widow' jointure. She was now the richest woman, other than the Queen, in England. In 1592, marriage of Arabella to Raunutio Farnese, a son of the Duke of Parma, was discussed. Parma wished to see a likeness of this important young lady. Two miniatures of Arabella, by Hilliard, were in existence and one was obtained (it is not known how) for the Duke to see. But the Duke of Parma died shortly after, leaving all plans of marriage for Arabella shattered once again. There were many plots attempted to reinstate the Catholic Church on the Throne via Arabella. A rumour sprang up purporting that Henry Percy, ninth Earl of Northumberland, a powerfull catholic, sought Arabella for his wife. The Percys wielded great influence in the North, where the nobles had been known to be sympathetic to Mary, Queen of Scots. Queen Elizabeth knew the Percys as potential trouble makers with a family history of plotting and double-dealing not calculated to inspire confidence. Henry Percy had no cause to love the Protestant ruler of England. But Bess assured the Queen of England that this would not happen. In 1602 Arabella was not getting any younger and longed for marriage. She began to plot her own marriage to Edward Seymour, the eldest grandson of the Earl of Hertford and Catherine Grey. Both Arbella and Edward were claimants to the throne. The Earl of Hertford apparently didn't gain sympathy for young lovers through his own experience with the Queen cousin. His eldest son, Edward, married Honora Rogers, a girl far below his station; Hertford did everything he could to end the marriage and his son threatened to commit suicide rather than return to Hertford's home. A servant, Dodderage, was sent by Arabella, on a horse provided by Henry Cavendish, with a message regarding the marriage of Edward Seymour and Arabella Stuart. On 30 Dec 1602, Dodderage was held in the gatehouse jail at Westminster for being involved in a plot against the Queen of England. Arabella awaited the return of Dodderage and Edward Seymour her future husband. On 7 Jan 1603, Sir Henry Bronker, the Queen of England's right-hand man, arrived at Hardwick. He gave a letter to Bess and asked to speak to Arabella in private. Arabella was made to write her confession on paper. The attempt disappointed him and he eventually wrote the confession and she signed it. Arabella begged pardon from the Queen. Bess asked that her grand-daughter be placed elsewhere to learn to be more considerate or to bestow her in marriage. The Queen wished for her to stay at Hardwick and have gentlemen and gentlewomen watch over her actions. Bess replied informing the Queen that she could not guarantee good carriage of Arabella. 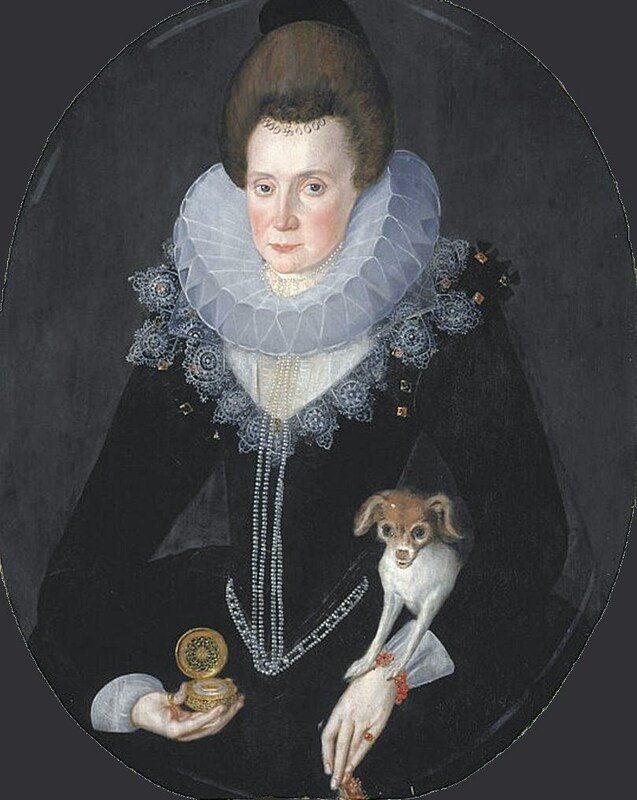 Arabella refused to eat until she was removed from Hardwick. Bronker returned and Arabella told a story of promised marriage and love which was untrue and had to be pardoned once again. Arabella wrote many incoherent letters to Bronker and it was concluded that she was insane. Bess was asked to stop the letters. Violent scenes followed between the two women. On 10 Mar 1603, Henry Cavendish and Henry Stapleton, a catholic, planned to help Arabella escape from Hardwick. This was not planned well. They went to Ault Hucknall to watch from the church tower for Arabella to take her exercise in front of Hardwick. However, they were unable to obtain the key from the Vicar. Bess did not allow Arabella to pass through the porter's lodge on any occasion. Henry Cavendish and Henry Stapleton went to Hardwick and asked to speak to Arabella. Henry Cavendish, known as the bad son, was allowed into the house, but Stapleton was not. Arabella talked with Henry and walked to the porter's lodge with him. Bess's servants did not allow Arabella's passage through the lodge, as it was then known that 30-40 men waited for them at Hucknall Village. The Queen heard of the attempted escape and threats on her life and sent Arabella to West Park, Bedfordshire, house of the Earl of Kent and Bess was left in peace. She arranged many grandchildren's marriages until her death. On 24 Mar 1603, Queen Elizabeth died and her successor was her cousin, James VI of Scotland. Bess did not include her son, Henry Cavendish or her grand-daughter, Arabella, in her Will. In 1605 Arabella visited Bess for the peerage of William, on behalf of James VI. She was given £300 in cash and a gold cup. Early in 1608, Bess reported to be so ill her maid could not leave her bedside, day or night. She died on 13 Feb 1608. In 1610, when she was 35, Arabella made the most dangerous of possible marriages with William Seymour, the younger brother of the Edward Seymour she tried to marry in 1602. With this marriage, the two lines of descendants of both sisters of Henry VIII were united, and both Arbella and William were claimants to the throne. So great was the panic at court at the prospect of a new and threatening dynasty that they were deliberately separated shortly after their marriage. Arabella was sent to the Tower of London where she died in 1615.